The cornerstone of the "new Naples"—the cleaned-up square, Piazza del Plebiscito, rescued from decades of service as a squalid parking lot. As recently as the early 1990s, the old adage, "See Naples and Die" —meaning, of course, that after the beauties of Naples, only Heaven, itself, might have something to offer— was often cynically twisted on the tongues of Neapolitan wags to "See Naples Before it Dies" and, ominously, "See Naples and Get Killed". Now, amidst all the talk of a Neapolitan renaissance, the skeptics are still around, to be sure. They are quick to warn you against bandying about phrases such as "renaissance" too freely. Remember, they say, that even the version with the capital "R," while boasting Leonardo and Michelangelo, also had lots of corruption, murder, intrigue, and pestilence—not unlike modern–day Naples, they say. Yet, in Naples, today, even the skeptics are sitting up and taking notice. Things may be changing. Maybe. Change in Naples has always meant building, tearing down the old to put up the new. From the great passenger terminal at the port of Naples to the main post-office, the city is still marked, for example, by the gleaming façades of monolithic Fascist architecture of the 1920s and 30s. The buildings were a cosmetic fix and now serve as reminders of the giant egos of ideology and sit there like white elephants dozing in the sun. Before that, Naples at the turn of the century was literally gutted in the course of a decades-long splurge of urban renewal. The broad streets and new buildings of 1900 are still there and they are still impressive; yet, in retrospect, it is good to remember that even that kind of mammoth renewal of the city's physical plant was not enough to keep hundreds of thousands of Neapolitans, precisely those who were supposed to benefit from the project, from emigrating during that same period. Modern urbanologists have likened that particular renaissance to treating cancer with plastic surgery. Ironically, it was the very gigantic nature of that decades–long urban renewal that displaced thousands upon thousands of people, actually driving at least some of them to leave Naples. Then, back in the early 1800s, Napoleon set up his brother-in-law, Murat, as king of Naples. Murat built entire new portions of the city, including a Pantheon–like temple to Napoleon (now the Church of San Francesco di Paola, seen in the photo, above) across from the Royal Palace. Before that: the grand-daddy of all urban renewal projects, the Spanish remake of the city in the 1500 and 1600s, including the so-called Spanish Quarters, one of the first examples in Europe of square blocks of four and five-story apartment buildings (which, at the time were barracks for Spanish troops garrisoned in the city). None of this, however, can be said to have worked, at least in the sense of truly dealing with what ails Naples. First of all, the Naples that generations of tourists have avoided for years is still very much there. The city is a microcosm of all the social ills that any big city could possibly be heir to. Petty theft is rampant, and organized crime is tenaciously entrenched. The unemployment rate among working–age males is said to run as high as 40% (! ), and the city's two main universities are homes for aging history and literature majors in no hurry to finish school and swell the ranks of the jobless. Also, thousands of illegal immigrants from Africa now strain the city's already overburdened social services as they sneak into the city to find no jobs except peddling knock–off leather bags, baseball caps, and bootleg CDs on the street or offering to wash your windshield at stop-lights. Or, if they are women, they may wind up with underpaid and undeclared jobs as an au pair —or, worse, join the ranks of the African prostitutes who line the ancient via Domiziana as it winds north out of the city. These unfortunate souls join the ranks of native underclass —not merely unemployed, but perhaps unemployable, one of the few bodies of lumpenproletariat left in Europe, people with no skills to sell. Now, add to this litany of woe the important little things such as public health: hepatitis is endemic (Neapolitans commonly eat shell-food cultivated in beds set perilously near sewage outlets in the bay), and half a century after the invention of a polio vaccine, it is not unheard of to see young people with the withered limbs characteristic of that scourge. In short, Naples seems to be much the same city that so many Neapolitans have left over the years for a better life elsewhere. What then has changed? Well, for starters, another wave of construction is rolling in. There is a new Civic Center (photo. left) going up on the east end of Naples. It is a sparkling boom-town of steel-and-glass office buildings and condos surrounded by spacious pedestrian malls and equipped with restaurants, shops, and underground parking. Eventually, the complex is meant to house all the municipal office space for the Naples of the future as well as provide substantial living space for thousands. It was also to be the home of NATO's new headquarters for the Allied Forces Southern Europe (AFSOUTH). That plan has been scrapped for various reasons, not the least of which is that this sparking satellite city is in the worst part of town right next to the huge prison, Poggioreale. The current occupancy of the finished office-space and apartments is still low. Public transport is improving, too. New busses, some of them the extra-long version with that accordion bend in the middle, cautiously cruise the streets as wary drivers try to maneuver all those extra new feet of bus safely around, not over, corners and feet. And, in a city that has raised the fender-bender to high art, the busses still look pretty good. Even the new subway, the metropolitana, mentioned above, is inching its way towards completion. With the most difficult part (on the Vomero hill above the city) finished, the new stations down at sea-level are in various stages of completion. Most problems now seem to be cultural rather than anything else; that is, for example, the digging if front of the old Angevin Fortress has uncovered the 16th century fortifications of the fortress, and decisions have to be made about what to leave and what to destroy. Similarly, excavations at Piazza Dante and on the main road, Corso Umberto, to the central train station, have uncovered bits and pieces of the original Greco-Roman city. Here, archaeologists and engineers have to come to a meeting of the minds, not always an easy thing to do. Safety from crime in the city —the common lament of tourists and natives, alike— is better because of a sledgehammer approach that is at least holding its own. The streets are crawling with police, augmented on occasion by flak–jacketed members of the regular Italian Army who patrol the streets and are positioned in front of public buildings and banks. In early June 2003, six of those floating mother-ships of tourists were in the port of Naples at the same time. They disgorged 8,000 passengers into the heart of Naples. No doubt, a few had their pockets picked or purses snatched or bought a genuine "Rolleks" or got otherwise scammed. I doubt if any one of them was assaulted physically. They sailed into an armed camp and probably felt safer for it. All of this is part of the new Naples. For Antonio Bassolino, mayor from 1993-2000, it was only the beginning. His idea of a renaissance has at least as much to do with restoring the cultural image of the city as it does with new buildings. The historic center of Naples is, after all, one of the select sites in Italy on the prestigious UNESCO World Heritage List, a veritable What's What of places in the world that must be preserved at all costs. That center is a square-mile at the heart of the original city founded by the Greeks half a millennium before Christ. It is an overlay record of many of the cultures and dynasties worthy of mention in European history since that time, from the Romans and Byzantines to the Normans and Hohenstaufens; from the Hapsburgs and Bourbons to the Bonaparte. Here are the streets where Boccaccio and Thomas Aquinas walked. Here are to be found paintings by Caravaggio and Sammartino's immaculate sculpture of the Veiled Christ. Naples is also one of the great cities of music in Italy, the workshop of Bellini, Donizetti and Rossini. 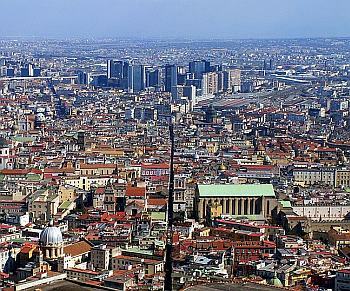 And the city is the logical jumping-off point for the rest of what grabs your fancy on and near the Bay of Naples: Mt. Vesuvius, Pompeii, Capri, Sorrento, Cuma, Amalfi, and the "Versailles of Italy," the Bourbon Palace in nearby Caserta. The next and biggest step in the rebirth of Naples was landing the G-7 conference in 1994. Roads were repaved and buildings painted; the entire city went through months of sprucing up for a two-week period during which Naples, for the first time in living memory, actually became a cosmopolitan city, an international center, a place worthy of saying that it had once been the capital of a kingdom. The G-Seveners were treated to English-language news broadcasts, and even the Neapolitan daily, il Mattino, published a daily supplement in English for visitors. It was professional and well-written, a welcome change from the past, when such efforts read as if they had been written by someone's cousin who took one Berlitz lesson in 1948. At least on the surface, the "renaissance," then, is working. Tourism is thriving in Naples. Millions of visitors no longer just jump off to go somewhere else. They hang around to enjoy a coffee or meal at a sidewalk restaurant, or to visit one of the city's dozen or so museums, from the overwhelmingly complete National Archaeological Museum to the recently opened National Railway Museum, which houses Italy's first steam locomotives. Visitors go underground to explore the original Roman aqueduct system, or to view the most extensive paleo-Christian catacombs in Italy south of Rome, or to visit the recently opened site beneath the Church of San Lorenzo where the main crossroads of the original Greek city have been laid bare. The city's main youth hostel, once a very lonely place to spend a night, is jammed with backpacking kids from around the world. In short, Naples is open and enjoyable. Beneath the surface, however, the skeptics remind us that there are questions that have no easy answer. When Naples was the capital of its own Kingdom of Naples, the entire southern half of the Italian peninsula plus the island of Sicily, the economy of the city quite naturally centered on the bureaucracies of running that kingdom. Those mechanisms became redundant when Italy was unified in 1860. Since then, they have had great difficulty adapting to running what is, essentially, just another very large Italian city with middle–class aspirations and a would-be industrial base. Unlike smaller cities, such as Venice and Florence, that can, and do, live very well from tourism, there is no way that Naples, hub of the most densely populated urban area in Europe is going to convert to one giant service industry for tourism. That is simply not going to happen. Also, Italy's highly-touted "clean hands" campaign, an anti-corruption and anti-crime program begun in 1992, continues to sputter along as it attempts to deal with the Camorra —the Neapolitan Mafia— which has its finger in most of the economic pies in Naples. The most recent flat tire on the wheel of Italian justice is a revision of law 513 that covered testimony given by so-called pentiti (from "to be penitent," thus, "those who are sorry"). These are ex-Mafiosi turned "stoolies" who give state's evidence in exchange for money and a place in a witness protection program. In the past, their testimony, given in private to the Italian State Prosecutor's Office, has been valid evidence in subsequent trials against the Mafia. Now, however, they must appear in a public trial and repeat their testimony openly and before those who are on trial. Their former colleagues in crime have let it be known that "those who are sorry" will be even sorrier if they re-testify. The papers are already speaking of a number of pentiti pentiti [sic]— "those who are sorry they were sorry." This is discouraging to law-abiding Neapolitans, who live in a region of Italy where there are 200 gangland murders a year. Neapolitans see one ex-Prime Minister, Bettino Craxi, who was, until his recent death, in well-heeled hiding in Tunisia, fighting extradition back to Italy on charges of corruption; and they see, and are generally skeptical of, ex-PM Giulio Andreotti's recent acquittal for alleged Mafia links. Thus, any relaxation of the war on crime does nothing to foster trust in the government. Traditionally, in Naples there has not been much of that trust to begin with. Naples is a place where people still commonly proclaim that "only fools pay their taxes," and there is no realistic estimate of the enormous amount of untaxed "phantom" money in circulation. It is wealth based on everything from the sale of contraband cigarettes and bootleg CDs to no-receipt transactions with merchants. Even many doctors will let you pay less if you don't ask for that official numbered government receipt that documents the transaction for the tax collector. This degree of economic anarchy creates, paradoxically, a look of opulence in a city where so many people say they have no money. Everyone seems to be hustling something, and a normal weekday along via dei Mille, a fashionable shopping thoroughfare, looks like Christmas on New York's Fifth Avenue. People think nothing of dropping 150 dollars for a pair of shoes or 200 for a sweater. And in a city that still has post-WWII rent-controls in much of the downtown area —meaning you can still pay as little as one-hundred dollars a month— if you want to buy a flat overlooking the bay, it can cost a cool Manhattanish one-million dollars. 2008 update: Before you get carried away with optimism, read this item on the garbage crisis.